—Stanton Peele, Ph.D., author of Recover! MYTHS HAVE A WAY of coming to resemble facts through repetition alone. This is as true in science and psychology as in politics and history. 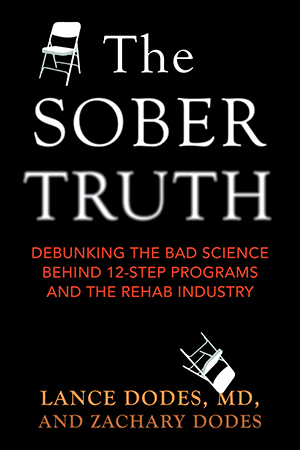 Today few areas of public health are more riven with unsubstantiated claims than the field of addiction. Alcoholics Anonymous has been instrumental in the widespread adoption of many such myths. The organization’s Twelve Steps, its expressions, and unique lexicon have found their way into the public discourse in a way that few other “brands” could ever match. So ingrained are these ideas, in fact, that many Americans would be hard-pressed to identify which came from AA and which from scientific investigation. The unfortunate part of this cultural penetration is that many addiction myths are harmful or even destructive, perpetuating false ideas about who addicts are, what addiction is, and what is needed to quit for good. In this chapter, I’d like to take a look at a few of these myths and examine some of the ways they impair efforts at adopting a more effective approach. This common myth essentially says that an addict needs to reach a point of absolute loss or despair before he or she can begin to climb back toward a safe and productive life. The most common objection to this myth is simple logic: nobody can possibly know where their “bottom” is until they identify it in retrospect. One person’s lowest point could be a night on the street, while another’s could be a bad day at work or even a small personal humiliation. It’s not unusual for one “bottom” to make way for another following a relapse. Without a clear definition, this is a concept that could be useful only in hindsight, if it is useful at all. A bigger problem with this notion is the idea that addiction is in some fundamental way just a matter of stubbornness or stupidity-- that is, addicts cannot recover until they are shown the consequences of their actions in a forceful enough way. This is a dressed-up version of the idea that addiction is a conscious choice and that stopping is a matter of recognizing the damage it causes. I have said it before, but it bears repeating: if consequences alone were enough to make someone stop repeating an addictive behavior, there would be no addicts. One of the defining agonies of addiction is that people can’t stop despite being well aware of the devastating consequences. That millions of people who have lost their jobs, marriages, and families are still unable to quit should be a clear indication that loss and despair, even in overwhelming quantities, aren’t enough to cure addiction. Conversely, many addicts stop their behavior at a point where they have not hit bottom in any sense. There is a moralistic subtext at work here as well. The notion that addicts have to hit bottom suggests that they are too selfish to quit until they have paid a steep enough personal price. Once again we get an echo of the medieval notion of penance here: through suffering comes purity. Addicts no more need to experience devastating personal loss than does anyone else with a problem. Yes, it can be useful when a single moment helps to crystallize that one has a problem, but the fantasy that this moment must be especially painful is simply nonsensical. Finally, the dogmatic insistence that addicts hit bottom is often used to excuse poor treatment. Treaters who are unable to help often scold addicts by telling them that they just aren’t ready yet and that they should come back once they’ve hit bottom and become ready to do the work. This is little more than a convenient dodge for ineffectual care, and a needless burden to place on the shoulders of addicts. The first problem with this idea is its overt religious flavor. I have covered the many ways that addiction is a problem of the mind and not of the spiritual soul. “Surrendering,” in the sense that addiction organizations commonly understand it, means abdicating power to a presence greater than oneself to attain guidance. It’s not surprising that many addicts chafe at this notion, not least because it requires a belief system that may not jibe with their own. A bigger problem is that surrendering is tantamount to agreeing that one is incapable of managing one’s own life. AA’s literature ties this idea once again to a moralistic adage: “Our whole trouble had been the misuse of will power.”1 Surrendering becomes a way to toss out a useful sense of selfhood or agency precisely when it’s needed most. And of course the very notion of surrender is problematic when viewed through the prism of a more psychologically sophisticated understanding of addiction. As I outlined in chapter 5, the emotion that precipitates addiction is helplessness. Addicts find certain forms of helplessness utterly intolerable, and the addiction is an effort to reverse that. Asking them to surrender their free will in response to this problem is diametrically opposed to what they need to do: feel empowered. As we saw in the first-person accounts in chapter 6, the dissonance created by this emphasis on surrender is one of the big reasons so many addicts don’t get better in AA.